Christopher B. Darby is a founding member of Counselors Title, LLC and a principal in the law firm of Pardo & Drazin, LLC (formerly Darby, Nalls, Smyth & Muldoon, LLC). He is also the Co-managing Attorney of the Counselors Title Dupont Circle Office. Prior to founding Counselors, Darby served as a settlement attorney, office manager and the Director of D.C. Operations for Universal Settlements. A native of the Washington area, Chris entered into the title business in 1998 after receiving his law degree from the University of South Carolina. 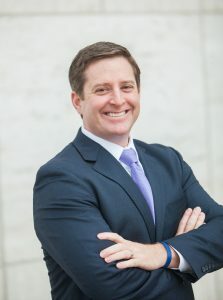 He is a member of the District of Columbia and Maryland Bar Associations and enjoys regularly teaching continuing real estate education courses for local realtors as well as a Real Estate Transactions Law class at the Catholic University of America Columbus School of Law. Chris is also an active member of the local real estate community with service to and membership in DC Land Title Association and the Greater Capital Area Association of Realtors (”GCAAR”) where he has served on the Forms Committee (formerly Contract and Clause Committee) since 2001. Chris was honored by GCAAR as its 2007 Affiliate of the Year for his service to the real estate community. He is experienced in residential and commercial real estate transactions and the resolution of contract issues. Licensed to conduct closings in DC, MD and VA, Chris specializes in DC specific matters including; land development, condominium conversions and TOPA. We provide convenient Continuing Education Classes for Real Estate Training and education. Learn More.